I wander blind, despite my fright. A monster lurks, of that I’m sure. I’ve reached the edge, the dark impasse. A creak, a hush, a laboured sigh. “My dear it’s time to bid adieu”. Its prickly skin as sharp as pins. I cower at its ghastly sight. A crash, a screech, its cry of glee. The last I see, the apple tree. Meanwhile, the appletrees were just trying to be helpful, "Hey, go that way. Look, I am pointing with my shadowy branches!" What awful dreams. But you certainly captured it, in words and especially, in your art. That gave me the creeps. The apple stuff not Bugs. I liked Bugs. Whoa! Usually apple orchards bring on feelings of fun and joy and pleasure. 'Course, I've never been in one at night . . . ooooooo! Your painting and poem perfectly captured your nightmare-ish feelings. Oooooooo . . . Such a cute piece Rain! That's so scary getting lost like that. That is a bad dream! However, in my usual creepy fashion I just love that painting. I feel for you but in my next breath I am all like...ooooh that would be so neat to be in the orchard at dusk. I am just so weird. It sounds like The Wizard if Oz when the apple trees were throwing their own apples. Terrifying dream but fantastic painting. Will try to find time to read the poem tomorrow. Sounds spooky and I love spooky stuff. And apple orchards. But not so much carrot juice, even though I drank my share. What a fun and great poem! You are clever. Thank you for the sweater and socks love. At first I thought you didn't like the color of my shawl but reread your comment and figured out you were asking about the texture of the yarn. It's 100% wool but against my neck it doesn't feel rustic like the pure wool of a wrap I had made some time ago. I think it's fine and will be even softer after a blocking. It all started off wonderfully with Bugs (such a great drawing) and then WHAM all that creepiness. What a scary experience! Thank goodness it turned out alright. A painter AND a poet! Huzzah! How can something so peaceful ans beautiful as an apple orchard be so creeepyyyy. He poem and the painting. I love them !!! Your artwork is really awesome, especially the eerie one! And so is your poem. Wonderfully scary! Thanks Wisps of Words :) I'm so used to these nightmares...I've tried so many things, but I think I'm at the point where I accept them and use them as part of my art! Hi Marsha :) Glad you enjoyed Bugs...being in that orchard gave me the creeps too. Hi Mama Pea :) Your reaction is great, thank you! When I'm in an orchard during the day, it's wonderful...I just happened to be there as it got dark...not fun! Thanks Christine :) No, it wasn't fun and I actually did the same thing in a corn maze once too...I need to learn my lessons lol! Hi Birdie :) Oh that is so cool, you are right! Those Wizard of Oz trees were such meanies!!! Thank you! Hi Stefanie :) Thank you! I enjoyed writing the poem, I have so many of them, some more creepy though...I guess that's become my "style" :) I forget about the blocking. I have to remember that when I eventually finish something I started to knit lol! I liked your Bugs Bunny. I don't think anyone really remembers him and that crew anymore, I never see them on tv. I don't go out in the woods at night. There really are things out there that can do for you. You'd like our woods after a heavy rain. Methane gas is pushed up out of the soil, and it creates phosphorescent "sprites." People used to think it was "Old Jack" out wandering the woods with his lantern, looking for lost souls. Wow..I'm late in my visiting....but so glad I had time this morning to read your entire post and enjoy it all. First, your cartoon of Bugs just made me laugh out loud, as it reminded me of a story my sister tells having two boys. The way bugs is pulling at his pj's was how Stuart would stand at the toilet, scratching his sides and letting the pee go wherever it wanted...haha..boys..not always having good aim. 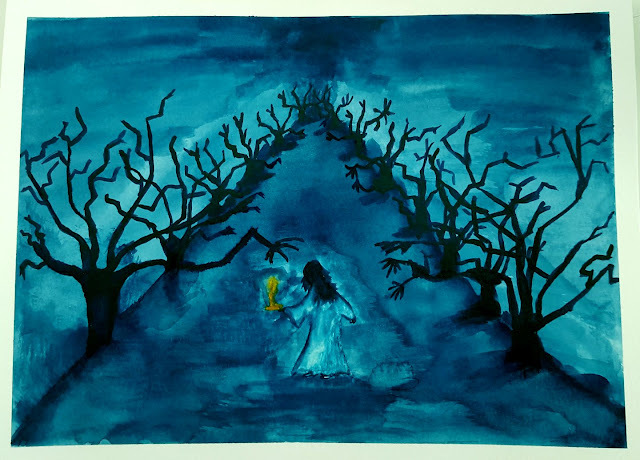 And your Apple Orchard dream (nightmare) certainly got your creative juices going, what a wonderful poem and story to illustrate your watercolor. Excellent!!!! Great sketches but I have to say I LOVED your poem...written so well and it definitely had me thinking - "Get the heck out of there!" Well done! Your real life experience probably wouldn't have been so scary if you'd had someone else with you. We seem to feel more comforted when we are not alone in those type of situations. I have some spooky stories of my own so I know how scary it can be. I can definitely see where the nightmare and poem came from. Your poem and your painting are eerily beautiful. It must have been such a strong feeling that you had getting lost to evoke such a masterpiece. Bravo. Looks like some comfy pajamas for Bugs. Just the way they should be. 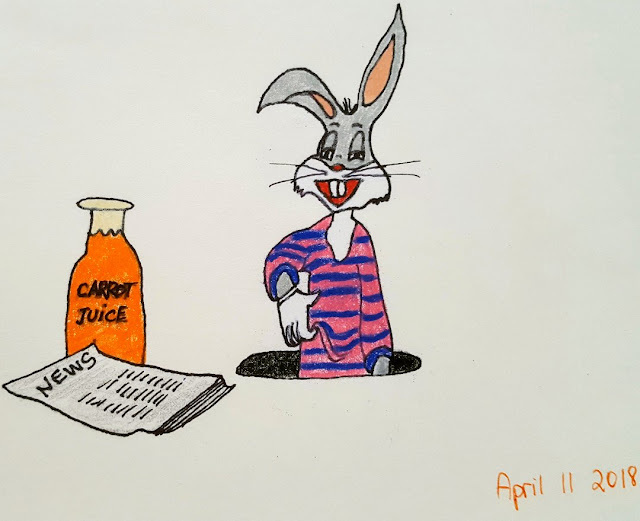 Can't say that I've ever had any carrot juice–have you?! I'm sorry about your nightmare! Very scary!!! You painted and wrote about it perfectly!! You captured everything!! That's fun Yarrow :) I had such a crush on Dean...and of course, loved his dad!! The actor who played his dad did some good movies after! I think I stopped when Dean came back from hell though. I have a soft spot for Castiel...they have such good characters! this is cary to get lost in orchard alone dear Rain! absolutely BEAUTIFUL poem with such great rhythm and amazing narration ,LOVED it ! i don't know i can count your skills ever my lovely ffriend ! you might want to get some of that squeeze on stuff for the bottoms of the slippers which make them nonslip, if you have wood or linoleum floors. nice to see dog doing well. Wow! I can just imagine what a horrible dream and some reality could scare a person terribly! I've had some douzies over the years but only when I was stressed and now I've rid myself of stress I have no bad dreams. Your poem is excellent as you really conveyed the feeling! I hope I don't dream about apple orchards tonight! LOL!